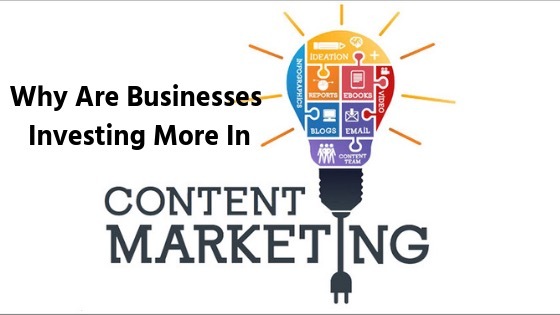 Why Are Businesses Investing More In Content Marketing? People nowadays want to keep themselves abreast with the latest happening. They want content to solve their problems, they need content for leisure time and they need online content for each and everything that happens in their life. This has led to an upsurge of content marketers who have taken part in an invisible race to appear as the most knowledgeable among viewers with their content marketing skills. With this, the businesses, small or big, are also taking their turns to invest in content marketing. This post deals directly with the factors that encourage these enterprises to delve into content marketing. Content Marketing has many braches like videos, advertisements, animation, blogs, articles, photo album etc. and each is potent of increasing sales and generating revenues. Thus, all the businesses like to invest more in content marketing because the strategies can be effective in pulling the customer’s to their website which increases the traffic. This traffic upholds potential customers who would be willing to buy the product or services served on the website only if they are impressed with the findings on the website. To be visible on the search engine pages, the businesses must produce quality content and optimize it well so that Google gives preference to their websites. The customers also prefer those sites that are listed on the top 5 places on the SERPs. Thus, it is extremely important to invest in content marketing so that the popularity and authenticity of their website increases in their customer’s eyes. Cold marketing techniques have gone obsolete as the customers do not have time to get involved in such activities. Whenever they find time from their busy schedule, they believe in searching for content and this is where content marketing plays its role. Digital marketing technique lets the content reach the right screen tops and desktops, which again encourages entrepreneurs to invest in content marketing to sell their services and products. Content marketing is a potent tool that can be effectively used by one and all. Whether it is a small or a big business, online presence has become extremely vital. Thus, if the enterprise wants to have an online presence, they need to put their money in creating content that attracts the customers. This is why investing in content marketing field has become so important. As content has thrown the old marketing ways on a cold storage, it has grown popular due to many reasons. First of all, clients like going through content that is knowledgeable and helps them in their daily life. Moreover, their perception regarding the content provider gets better if they find what they are looking for. Due to this very reason, it has become extremely crucial to present the best foot forward and educate your customers how your products and services are better for them. And this can only be achieved with the help of a good content marketing strategy. As the horizons of content marketing are vast, thus more and more businesses are initiating their investment towards this field. If you are among the searchers of content marketers, then make sure that your hire the best that are well versed with the marketing skills and trends. Guest article written by: Preaa Sharma is working as a content marketing head at Content Elites. She has 5 years of experience in content writing and had her articles published at high authority websites. You can follow her company on Facebook and Twitter. Previous post: Is It Still Possible to Make Money Through BitCoin in 2019?